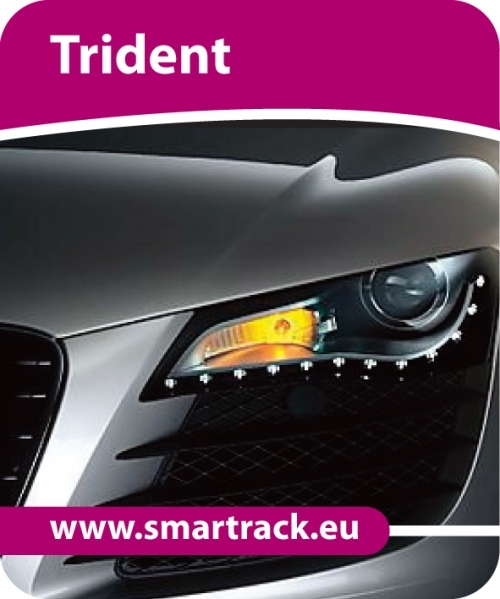 The Smartrack Trident is a revolutionary tracking product that can offer all the benefits of security tracking and also give the benefits of a fleet management tracker. Security tracking:- This product has been designed and manufactured in Britain for SmarTrack and has achieved e-mark and Thatcham TQA104 status. It is ideal for Cars, Vans, HGV, Plant, Classic and high value vehicles. It has internal aerials for enhanced security, an IP56 ABS casing (water resistant ideal for all applications) a self contained battery back up and it even has a 3rd generation GPS aerial which means that it can be fitted to a car with heat reflective windscreen, and doesn't require a line of site to get GPS reception. Having all of these elements in a self contained unit along with the unit being 12 or 24 volt compatible means that the installation rule book has been rewritten. Ideal for Motorhomes, Car, LCV and HGV. The subscription covers your vehicle being monitored by the Global Telemetrics Secure Control Centre (SCC) 24hrs, 365 days per year. If your vehicle shows unauthorised movement (moving without the ignition being used). If you disconnect the vehicle battery an SCC operative will call you to check everything is ok with the vehicle as this acts as anti-temper to the device. If your vehicle battery is running low you will receive a text message asking to charge. Online AccountIt also gives you a login to a website where you can see your vehicles location so you know the tracker that you are paying for is working, rather than paying a subscription for years on end with no idea if it works or not. Full Fleet tracking can be added to the Trident subscription package by simply paying an additional £50inc per year. Full Fleet Features System reports to website every 2 minutes. Logs 1 minute History Stop/ start reports Multi named Geo-fence Google maps. Internet based. Live track on individual or whole fleets Reports of over speeding vehicles Reports via web can be exported to Excel Integrated GPS aerial (Sirfstar III) for anti tamper Battery back up as standard (battery disconnect warning again for anti tamper) Vehicle Battery disconnect shown on website (anti tamper) Report history Idle times Vehicle timesheets Live Traffic updates Vehicle Filter (grouping of vehicles) Direction of travelling vehicle Mileage counter Vehicle battery status shown on screen Top speed recorded on reports Multi log in access and resisted views. For many years customers have been caught in the dilemma where they need the security of a Thatcham approved security tracker that is monitored by a 24hr SOC (secure operating centre) but they also need the vehicle position information and reports that a fleet management tracker provides. So they were either forced to have 1 or the other, or pay for both. That is no longer a problem since Smartrack launched the Trident which also gives all the benefits of the SmarTrack Fleet when you pay the extra £50 per year. Subscription costs inc Vat:- £149 Per year or £399 for duration of ownership(Now including free European coverage).